Wind hurtles down from the icing-sugared Aran Mountains and whips up the surface of Bala Lake (also known as Llyn Tegid) like a wild Welsh meringue. It’s mid January and the lowest low pressure for a century is moving over North Wales, bringing with it icy winds, snow and hail. 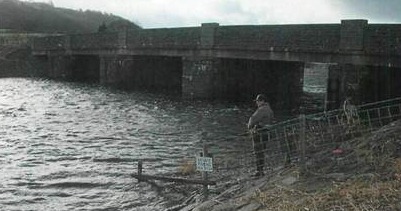 A wind-blown figure in the Gareth Edwards mould stands on the road bridge scanning the angry water of Bala Lake (Llyn Tegid). It’s so rough there’s nothing he can really do except contemplate the ancient lake in front of him and the snowcapped mountains beyond. 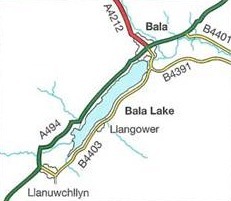 Bala is the largest natural lake in Wales, about four miles long and a mile wide. 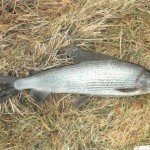 It is probably the only British lake with an established population of grayling. That’s what has brought Dewi Evans here today -grayling. 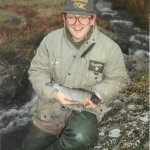 Dewi is a local angler who has fished for Welsh grayling all his life. He knows where to find them and how to tempt them — and he’ll certainly need all his Celtic craft to lure one in these conditions. 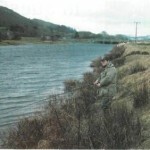 Casting a fly into a sheltered corner of Bala Lake’s wintry water. Note the rougher water behind. Dewi Evans is Bala born and bred. 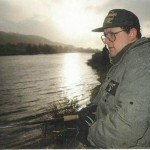 He has fished for local trout and grayling since he was six, and now runs a tackle shop in the town. 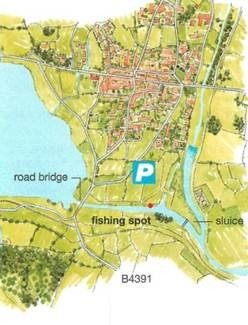 Fishing on the lake is controlled by Snowdonia National Park and they sell day tickets at a very reasonable price. Bala District A. A. has 21/2 miles of the River Dee and the River Tryweryn. You can buy a ticket for the Dee between the outflow and the weir, or a full day ticket for all society waters for a little more money. Tickets from Dewi Evans’ shop Eryr Sports And Tackle, High Street, Bala. Tel. 0678 520 370. 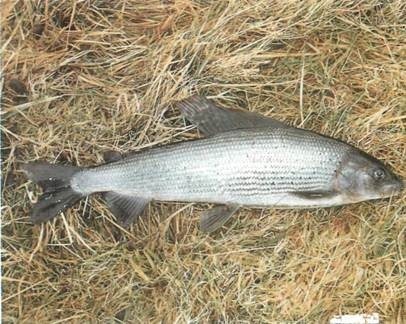 A borderland grayling – taken from the frontier zone of the River Dee as it empties out of the lake. Dewi located the fish only a few feet (1-2m) out from the bank, where it intercepted his double maggot offering in an area of slacker water. Dewi returns the fish to the Dee a little distance upstream of where he caught it. By doing this, he lessens the chances of disturbing any other grayling that might be in the swim and hungry. 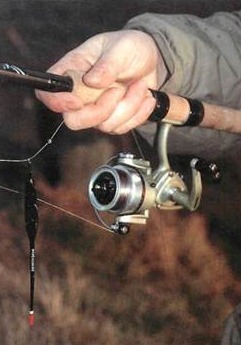 This is especially important when the fishing is hard. 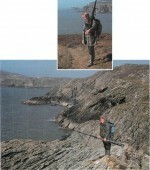 Dewi fished wet fly patterns such as a Soldier Palmer and a Double Viva, casting from the bank at Llangower Point. 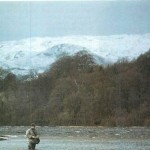 Shrouded in hailstones Dewi cradles his catch. The weather was typical of North Wales – changeable -strong wind, hail, light snow and sunshine hit during the session. Bala Lake lies at the edge of the Snowdonia Mountain Range so it’s used to all kinds of weather Dewi tries his luck below the bridge where the River Dee drains the lake. This is a good spot for large grayling. Dewi rounds off the session with a return to the river. 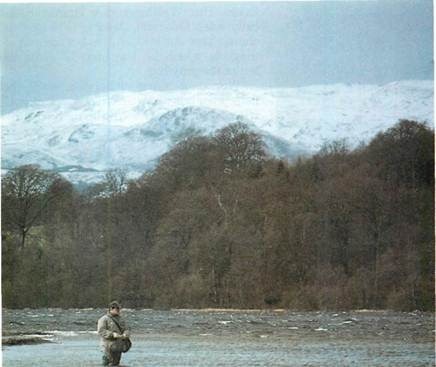 Once more hailstones start to fall, sprinkling him as he makes his final few casts in the Dee. 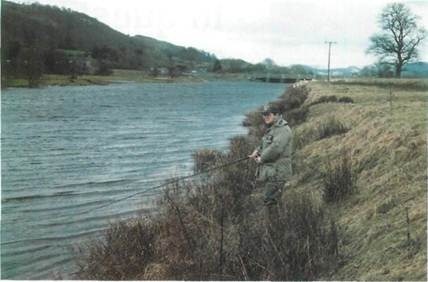 Although not a target today, the deep water of Bala holds a number of other species – brown trout, salmon, perch, big pike and, down in the depths, ferox trout. 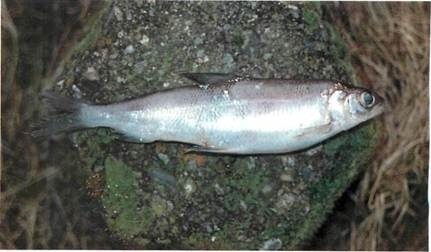 Bala is also the lair of the gwyniad – the Welsh whitefish akin to the Scottish powan and Cumbrian schelly. 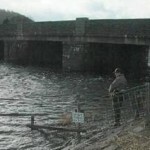 It’s a mysterious fish which doesn’t often show up, and when it does, it’s only in Bala. 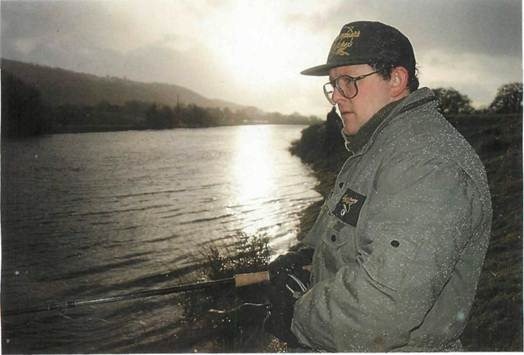 Like many local anglers, Dewi’s first choice is always to fish the fly: ‘We’re spoilt with the trout and grayling around here -they haven’t got that in the cities,’ he con- fesses. But Welshmen are characteristically adaptable and Dewi is prepared to change tack and make full use of the pint of maggots which he has brought along to tempt the grayling. ‘We’re not coarse fishermen, we’re fly fishermen but we’ll turn to coarse tactics if we need to,’ says Dewi, as he rigs up a 12ft (3.7m) match rod. 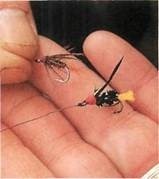 He attaches a bodied antenna float and 3lb (1.4kg) line straight through to a size 14 hook. The float submerges one or two times as it comes close to the bank but it’s just the hook catching on weed. Not so much as a whiff of thyme on the grayling front, so Dewi makes a brief trip to examine the nearby River Tryweryn as it falls over a weir and flows into the Dee. He spots something shimmering a greenish mistletoe-white on the rocks and moves to investigate. On closer inspection it turns out to be something of a Celtic surprise – a gwyniad. 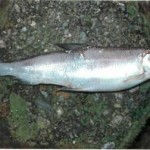 The fish has been washed up by the rough conditions. It’s not often you come across there’s a satisfying bend in the rod. 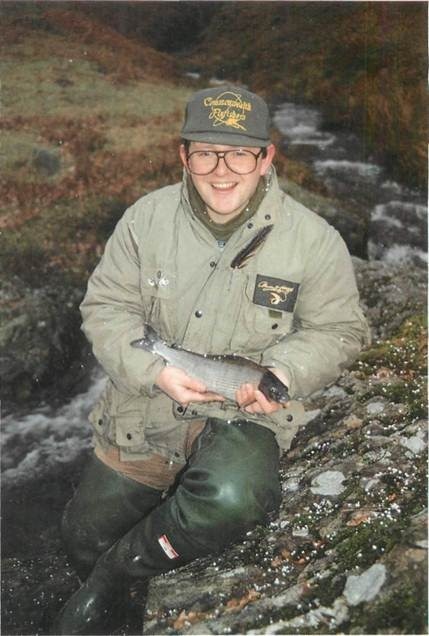 ‘We have a fish here,’ he says, just before a silver splash confirms his words. The grayling sets off wing-three-quarter-style, and resists like a Pontypool front row forward in the middle of a maul. But soon it is lying on the bank, its dorsal fin quivering with vitality and flashing the bold red of a Welsh national rugby team jersey. 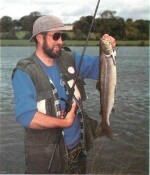 ‘It’s a nice big fish over a pound and it’s well hooked in the lip,’ says Dewi, examining the fish. ‘They’re full of muscle and they put up a bit of a fight. Normally the bigger ones take up position at the front of a shoal — there could be more fish here,’ he adds hopefully. 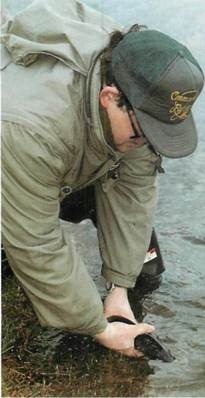 Dewi returns the grayling to the Dee and rebaits with double maggot before attacking the river again. For half an hour or so he explores the gwyniad since you can’t fish for them legally. But by chance Dewi has seen a few in his time. ‘The fresh ones smell of cucumber stronger than a smelt,’ he says. ‘They spawn in January and February and after a storm they can get blown up from the depths too quickly, so you occasionally find one washed up – often with its eyes popping out.’ This particular fish is in pretty good condition considering its rough ride. Dewi gets back to business and concentrates on trotting his float about 2m (6-7ft) from the bank. The float wanders downriver along the edge and goes under. 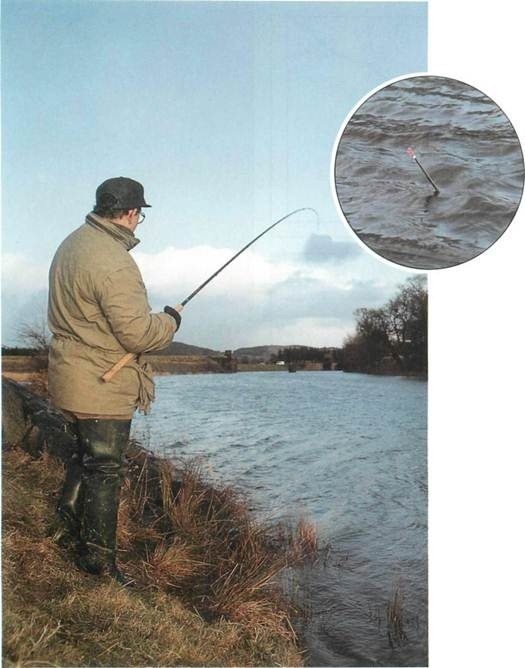 Dewi strikes and the float emerges – but now water, presenting the bait at different depths but makes no contact with a fish. It’s time to check the state of Bala Lake proper. Two goosanders fly low along the river course, over the road bridge and across the lake, helped on their way by the strong wind. Overhead a disorientated Bewick’s swan flies round in a large circle, lost and confused in the heavy atmospheric pressure and blowy conditions. Conditions are so rum on the lake that Dewi can’t fish where he would like to. He’s forced to move some way round the lake to Llangower Point where it’s more sheltered. After a ten minute trip in the car we reach a parking spot towards the other end of Bala Lake. The lake in this area is about 45m (150ft) deep just a short distance from the bank. A heavy shower of hail starts suddenly. It doesn’t last long but leaves the backs of our necks red raw where the frozen missiles made stinging skin contact. On foot we cross a narrow gauge railway line which used to be the main line between Chester and Dolgellau. Now it’s only used in summer by the masses of tourists that descend on Bala. We disturb a buzzard as we walk through gnarled oak trees before arriving at the point. It’s noticeably calmer on this side of the lake. 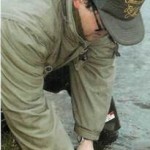 Dewi gets out his 10ft (3m) Loomis fly rod, wades into the lake and starts casting and retrieving. In the distance across the lake we can see Bala town taking a beating from heavy rain. It remains dry on our side but the wind is still quite strong. 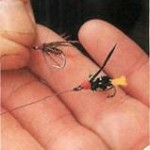 He works his two flies in the rough water – a size 16 Double Viva on the point and a Soldier Palmer on the dropper. ‘I’ll try the Viva because it’s a good general purpose fly with a bit of weight to it,’ Dewi explains. ‘Normally I would fish farther round the lake where the river comes in, but it would be hopeless today. Beggars can’t be choosers,’ he adds philosophically. For a few minutes the sun comes out and bounces off a snow-covered peak in the distance. 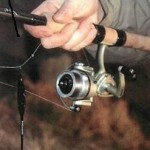 But the wind continues to blow and Dewi has to supply more and more power to his flies. 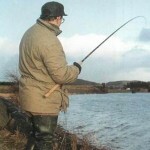 He tries the bait rod for a while but if there are any grayling in the area they are not in the mood. Undaunted, Dewi returns to the Dee where he caught the grayling earlier. But that fish remains the solitary prize.